Play some funky music Mumble! 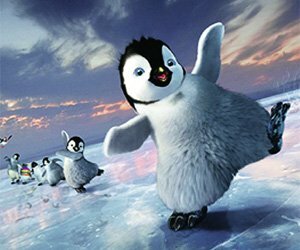 Come join us in Antarctica for a Happy Feet Party with all your penguin friends. The jukebox musical movie makes for a splash hit party for both girls and boys! Fun Happy Feet Birthday Party Ideas to make your kids birthday HAPPY! “Come join us in Antarctica for a Happy Feet Party with all your penguin friends”. Also add the birthday party information, time, date, etc. Happy Feet Characters: Memphis, Norma Jean, Mumble (main character), Gloria, Noah the Elder, Ramón, Lovelace, Boss Skua, Dino, Frankie, Vinnie, and the Amigos. Cut and draw snowflakes. Fold white paper and cut out designs. Remember all snowflakes look different. Add some glitter glue to make the snow shimmer and glitter like real snow. Pass the Egg. Toss back and forth water balloons and try not to break them. Or have two buckets of balloons per team. Each team member has to race the "egg" to the other bucket with out breaking it (by placing it on a spoon). Which ever team has the most eggs in their bucket at the end of the game wins. Play the Happy Feet video game or play the Wii penguin game found on the Wii fit. The penguin slides back and forth trying to catch as many fish without falling off the ice chunk into the icy water. 2011 they are hoping to release a sequel which you could go and see in the theatres! Mumbles Moves. First teach a simple tap dance move or two. Then start a dance contest or dance party. There is nothing better than seeing little kids make up dance moves. Too cute! Race of the Penguins. Put a plush penguin or water balloon in-between legs (at the knees) and race like a penguin!